Shiny Pokémon - Yes, for the first time ever on The Pika Club we now have shiny Pokémon! Not even TPC RPG had these. Shiny Pokémon, like in the games, are obtained by chance while breeding. Don’t worry if you’ve got a non-breedable Pokémon you want a shiny version of however – there is a way to turn Pokémon you’ve already obtained shiny! 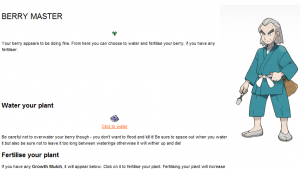 Berries - After the addition of items last update come berries, which this update is named after. Berries play quite a large role in the new Adoption Agency, having numerous effects on your Pokémon. 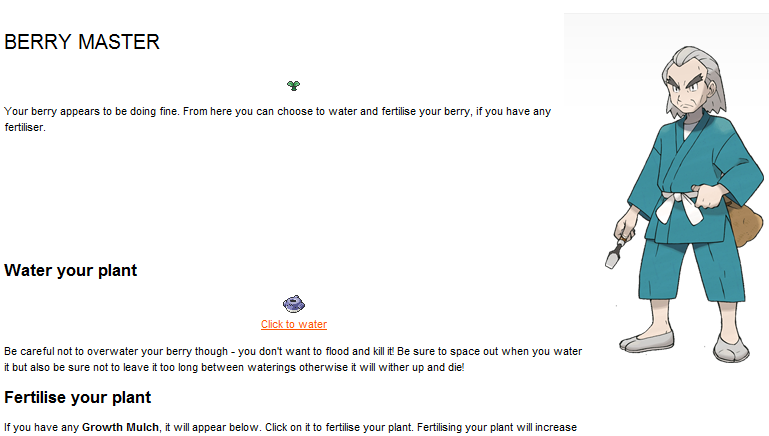 You can also grow berries yourself. 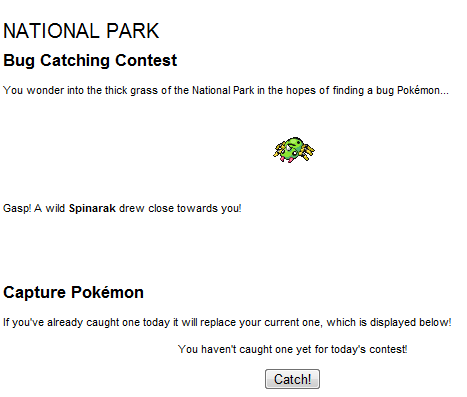 Bug Catching Contest - Yet another new feature is the Bug Catching Contest, set in the National Park. 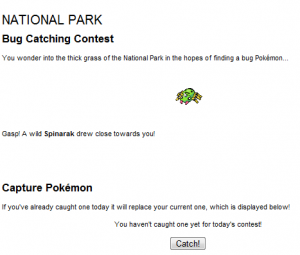 This is a contest that runs every day with the aim of catching the strongest bug Pokémon you can. What sets this feature apart from others however is in the Bug Catching Contest your opponents are other players! This is a short overview of the latest update. For a more detailed overview, including more new features, click here. Your Bag – Items are now available! This adds a whole new world of potential to the Adoption Agency which will be built upon in later updates. 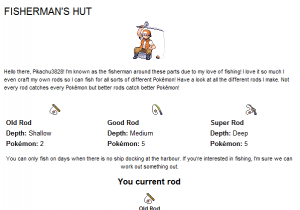 Fishing – For the first time you can now fish and catch live Pokémon! 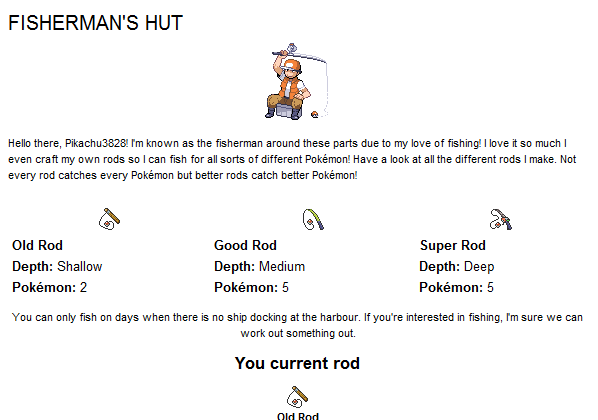 Not only that but you can upgrade your rod just like in the games to catch more and better Pokémon! Travelling - Another new feature is the option to travel to new and exotic places which allow the capture of all new Pokémon and all new adventures! Of course there are more features and in addition to these there are 5 new achievements and over 30 new Pokémon including some of these below. 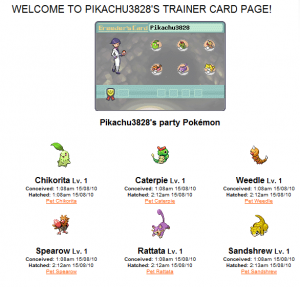 The Pika Club Adoption Agency has had a major overhaul. In the past tradition would name such a massive update as something like The Pika Club Adoption Agency v2.0 but for the sake of simplicity I’ll break from tradition and keep the name The Pika Club Adoption Agency. This can be considered the spiritual successor to TPC RPG v4 in many ways as that project has not been worked on in a long time and I am now announcing is officially cancelled. I had always said during TPC RPG v3’s lifetime that if the Pokémon games came up with a decent method of trading, battling and playing with others worldwide then I would quit and I feel that the Pokémon GTS has succeeded in doing just that. For fans of the RPG you’ll find many familiar features in the new Adoption Agency. You don’t battle Pokémon or complete missions, but here’s a quick rundown of all the new features as compared to the old Adoption Agency. Your Trainer Card - This has replaced your Pokémon. 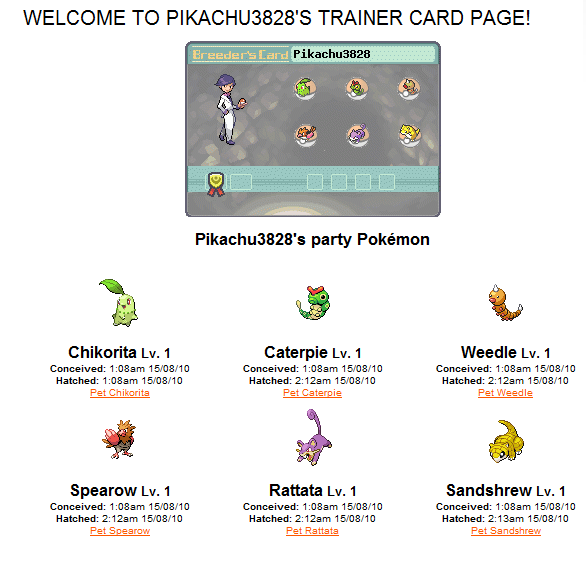 Rather than 1 Pokémon now you have a party of 6 on you at all times that visitors can interact with! You have a box for extra Pokémon that you can use to switch around at any time. Your Trainer Card is highly customisable and will automatically update your card wherever you’re showing it as soon as you make any changes! Breeding Centre & Trade Centre – You can now breed compatible Pokémon! As long as you have male and female Pokémon of compatible egg groups you can now breed the two to produce an egg! You can then trade this with other breeders on the Adoption Agency if you wish using the Trade Centre. The screenshot also shows off another new feature – many features now take place in real time. That mean, for example, that hatching eggs no longer relies on a certain amount of clicks unlike the old Adoption Agency. Now eggs take time to hatch and clicks help speed up the hatching process! Your Pokédex - Now you can own more than one Pokémon it only makes sense that you would have your own Pokédex! This will automatically update the seen/caught amounts as you explore the agency and interact/trade with others! With over 100 Pokémon currently available, you will have your work cut out to catch ‘em all! Your Achievements – A brand new feature is achievements. 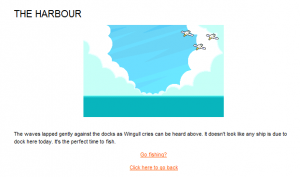 Achievements are small tasks that you can perform around the website in order to unlock various exlcusive prizes. 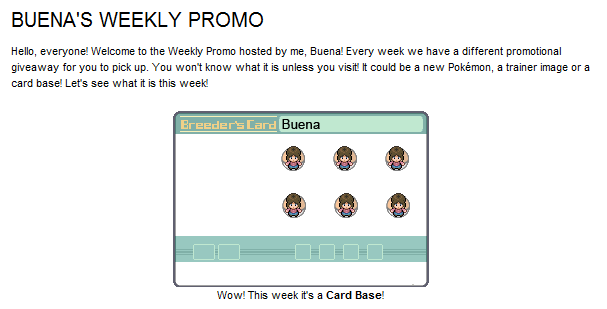 These can be either new trainer images or card bases for your breeder’s card or Pokémon eggs unavailable anywhere else! Most achievements tell you how to unlock them but some are hidden that you must find for yourself! Daily and weekly events – Real time events have also been incorporated into the Adoption Agency to make sure you always have a new experience every day you visit! 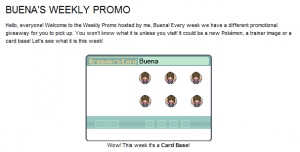 For example, as in the picture above every week Buena gives away a new prize for you. It could be a new card base, a trainer image or a new Pokémon egg! You won’t know unless you visit each week! As this is such a big expansion we’ve given the Adoption Agency its own forum which you can get to here. Please tell us what you think of the new Adoption Agency! We want to know what you think of it, what parts you like and dislike and how you think it could be made better!